Tripolia Gates are very famous from the time when they were built because the Royal possession used to come out through this gate only. 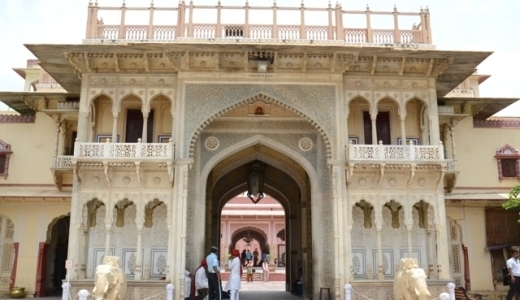 The entrance through this gate is only allowed during celebrations or when some royal guests arrive in the City Palace. The death processions of the Maharaja would also pass through the same gate while those of the Maharanis were taken through other gates to the Chhatris of Maharanis where they were cremated. The gates are also famous because the processions of Teej and Gangaur used to come out through these gates only. Queens and other ladies of the palace can watch the processions through the holes which are built over the gate. The boxes which are visible from the sides of the gate were built by Maharaja Man Singh (1922-70) for making the gates more beautiful. Two canons outside these gates are placed by the present Maharaja Brigadier Bhawani Singh which were earlier lying near the outer gates of City Palace. Through these the beauty of the gates also increased. The first courtyard, while entering from the Tripolia side, houses the Mubarak Mahal, which was built by Maharaja Madho Singh II , late in the 19th century. The Mubarak Mahal, is also known as the Auspicious Palace, which was earlier used as the reception hall for the Maharaja of Jaipur. At present, the ground floor of this Mahal is used as an office and a library while the first floor houses the Textile Museum. Many weapons are kept in the museum which is used by the royal family members. The museum also has various collections of royal costumes, folk embroidery, rare and invaluable Pashmina Shawls, Sanganeri prints and Benaras silk saris. Some of the clothes worn by Maharaja Sawai Madho Singh I are also on display. Tripolia Bazar also gets its name through the Tripolia gate only because it is located near the entrance gate. This is actually the main entrance to the City Palace and Jantar Mantar. Tripolia Bazaar is known for ironware, brassware and carpets. The bazaar has many shops in it utensils, rugs, textiles, furniture, trinkets and range of other items. The Maniharon ka Rasta is also there in this bazaar which is a good place for lac bangles. Apart from this, do look for carpets in this bazaar, as Jaipur is known for colorful and elegantly designed carpets right from the days of Maharaja Sawai Ram Singh II (1835-1880). Known for Indo-Heratic designs, the motifs used in the carpets are human figures, landscapes, flora, fauna and geometric. Durrie, a type of low quality carpet is also available here, nowadays used as an alternative for carpets. The bazaar is closed on Sunday. After the merge of Jaipur state of into Rajasthan, these gates were closed for the general public. However, only the members of the royal family and their guests are allowed to enter that way. Common people and visitors can enter the palace complex only through the Virendra Pol and the Udai Pol or the Atish Pol.